O.J. Simpson will go before a Nevada parole board on July 20 and could walk out of prison a free man this year after having served part of his 33-year sentence for armed robbery. The arrest and trial of former NFL star O.J. 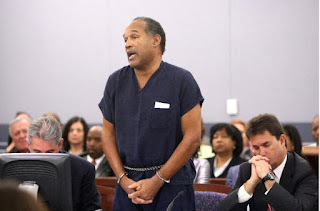 Simpson for the murder of his ex-wife, Nicole Brown, and her friend, Ronald Goldman, created a media frenzy. Lawyers, witnesses, police detectives, and even Judge Lance Ito himself became celebrities by being a part of this highly publicized trial. Courtroom terms became common topics of conversation as millions of people followed the trial of the former Heisman trophy winner and celebrity.